The space shuttle Discovery is prepared for launch at the Kennedy Space Center in Cape Canaveral, Florida, on Feb. 23, 2011. As Discovery begins its 39th and final mission into Earth's orbit Thursday, America’s 30-year space shuttle program comes one step closer to its scheduled end this April. The aging fleet of reusable spacecraft has become an American technology icon, ferrying astronauts and mobile laboratories into space and helping in the construction and resupply of the International Space Station. Discovery has been a regular visitor to Earth's orbit since its maiden flight in 1984. It is the oldest and longest-serving vehicle in the U.S. space agency’s shuttle fleet. Discovery’s final flight follows several delays due to technical problems and repairs to its external fuel tank, but NASA’s mission launch director Mike Leinbach says the shuttle is still space-ready. "It’s her 39th mission and [there] would have been quite a few left in her had the program been extended, but it wasn’t," he says. "It is a kind of bittersweet to get the last flight out of her, but she’s going to perform perfectly fine in orbit and bring the crew home safely." Discovery’s 11-day mission is a supply run to the International Space Station. On board are 3,855 kilograms of cargo including a large supply closet, a replacement radiator and a humanoid robot helper named Robonaut 2. 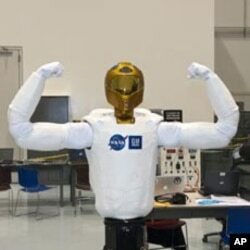 Robonaut (R2), the dexterous humanoid astronaut helper, flexes its mechanical muscles prior to its transport aboard space shuttle Discovery to the International Space Station. Over its long career in space, Discovery has been a real work horse says Valerie Neal, shuttle curator at the Smithsonian’s National Air and Space Museum in Washington. "It’s delivered satellites. It’s picked up and repaired satellites. It’s flown scientific laboratories. It delivered the Hubble Space Telescope and then returned twice to service it. It flew twice to the Russian Space Station MIR and then 13 times to the International Space Station." The Discovery is linked to many historic firsts. It was first to return to space after fatal accidents destroyed its sister ships, Challenger and Columbia. It was the first to have a woman pilot. And Neal says that, despite the inevitable dangers of spaceflight, Discovery has played a major role in making it more routine. “Certainly since the space shuttle began to fly, we’ve had people going up five, six, seven eight, nine times a year," she says. "We had no precedent for flying into space for 30 years in the same vehicles over and over. 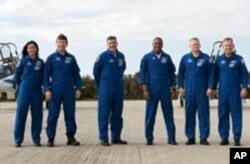 That’s approaching routine spaceflight." At NASA's Kennedy Space Center in Florida, space shuttle Discovery's STS-133 crew on the Shuttle Landing Facility runway. NASA plans two more missions, one each for the remaining two orbiters, Endeavor and Atlantis, before the Shuttle program ends later this year. NASA will then have to rely on European, Russian and Japanese rocket launches to carry astronauts and supplies into orbit until commercial U.S. space ferries become fully operational, possibly within the next five years. In the meantime, plans are still being worked out for putting Discovery and the other retired space shuttles on permanent museum display.